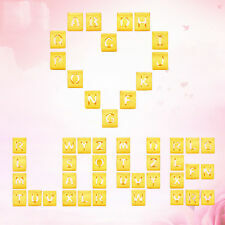 Hallmark: 足金 the gold content 999‰. DIY: If you need your favorite styles, we could customize and process the jewelry as you wish. Craft: Classic design, and good craft. All are qualified. We believe everything can be solved by open communication. 24K Gold 3D craft, gold contents 999 too. Stamped the standard hallmark in Chinese. 3D is unique craft, the inner part is hollow. Looks big, but weight light, enough strong. 24K Gold, gold contents 999. Pendant only, without chain. Pendant Detail. Weight: 1g. 24K Gold 3D craft, gold contents 999 too. Stamped the standard hallmark in Chinese. 3D is unique craft, the inner part is hollow. Looks big, but weight light, enough strong. 24K Gold, gold contents 999. Style: ChainLength: 18 - 19.99"
Lock: M Security Clasp. Total Weight: 18.90 grams. Made in USA. This beautiful bracelet features black agate with a 24k gold bead. It's remained in our vault along with other finer pieces. (This was made from a bracelet into a necklace.A 7" 24K diamond-cut bead bracelet was converted to a necklace by adding 5" of 18K yellow gold chain to each end. We can convert back to 7" Bracelet if you would prefer that;) . 24K Yellow Gold Tube Bead pendant/charm (versatile for bracelet chain or necklace chain). The handmade pattern of bead varies to unique engraved handmade design with natural imperfections. 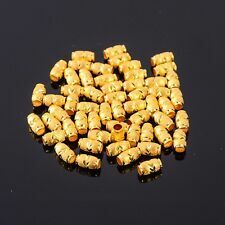 Size: 11.4mm length of tube bead x 5.08 mm width at widest middle section of bead. Ending Apr 22 at 6:18PM PDT2d 4hMetal: Yellow GoldStyle: ChainLength: 16 - 17.99"
Offered for sale is a rare vintage GURHAN gold/ Silver necklace; this fine piece is in great condition, gently used displaying minor signs of wear. The black silver bars contain a natural black patina with minor light scratches and tiny dings( hardly visible) please look at photos for details. Item specifics: Brand: GURHAN Weight: 11.2 Grams Metal: 24K Yellow Gold Hallmarks: Stamped inside “GURHAN/ NW660/ 0.990” for authenticity and tested for purity Size: 17" Length Features: Cylinder links of blackened silver each measure 10mm long. 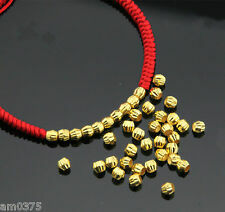 Yellow gold bead link measures 4mm diameter. Condition: Vintage (very good) Stock: 81082. 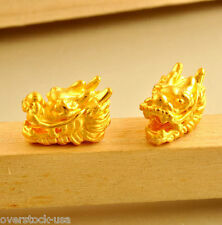 Style: ChainLength: 16 - 17.99"
Size: 8mm Width, 1.5mm Hole. Wear the right length. A necklace that falls just below the collarbone goes better with a plunging neckline than a high one. A necklace that falls below the bust goes with a high neckline. This Beaded Barrel necklace has a S Hook clasp and is 21" long by 4mm wide and it weighs 22.7 grams. Chain /Necklace Details. 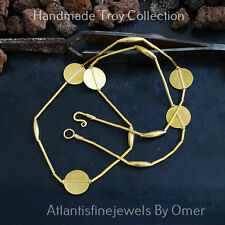 Unique necklace with great design. Weight (grams) For size references and conversions Google can be a very useful tool. DIY: If you need your favorite styles, we could customize and process the jewelry as you wish. It's really rare in China that people could do it perfectly well at minimum price. Hallmark: 千足金 the gold content 999‰. Hallmark: 足金 the gold content 999‰. DIY: If you need your favorite styles, we could customize and process the jewelry as you wish. Craft: Classic design, and good craft. Size: 28 4.5 mm, hole 2 mm. 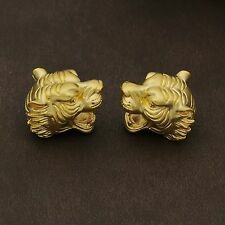 Material: 24K Yellow Gold. Size: 12mm H, 8mm W. 2.3mm Hole. Craft: Classic Craft. Special Jewelry for Special People. Wear the right length. A necklace that falls just below the collarbone goes better with a plunging neckline than a high one. Use occasion: You can take it as a gift gor your lover, your familry, your friend. High-quality Jewelry included the handicraft fee. A: Yeah,all my item is real gold, we test them before we get them from the factory. 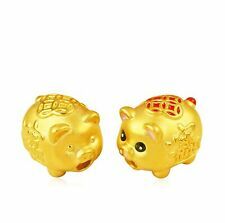 Hallmark: 足金(Standard Hallmark for 24k gold). Size: 8mm, 2.5mm Hole. Wear the right length. A necklace that falls just below the collarbone goes better with a plunging neckline than a high one. A necklace that falls below the bust goes with a high neckline. Hallmark: 足金 the gold content 999‰. DIY: If you need your favorite styles, we could customize and process the jewelry as you wish. Craft: Classic design, and good craft. It's really rare in China that people could do it perfectly well at minimum price. Hallmark: 千足金 the gold content 999‰. DIY: If you need your favorite styles, we could customize and process the jewelry as you wish. Size: 13 8.5 mm, hole 1.7 mm. We believe everything can be solved by open communication. 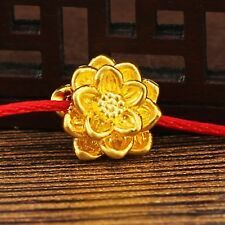 Metal(s): 24K Yellow Gold Weight: 1.1-1.3g (1pcs) Size: 13mm x 8mm (Hole size:3.5mm) Stamp: "千足金",the mean 999 gold Remark: Pendant only. without chain. This is for 1 bead. If you need more, contact us. Necklace Pendant Earrings Bracelet Ring Sport601. High-quality Jewelry Includes the Handicraft Fee! Weight: 0.8-1.3 g. Item Details. DIY: If you need your favorite styles, we could customize and process the jewelry as you wish. Hallmark: 千足金 the gold content 999‰. We will do our best to give you the most wonderful experience. We will try our best to reduce the risk of the custom duties. DIY: If you need your favorite styles, we could customize and process the jewelry as you wish. Hallmark: 足金 the gold content 999‰. We believe everything can be solved by open communication. We will fix the problem well until you are satisfied. Necklace Pendant Earrings Bracelet Ring Sport601. Weight: 0.4-0.6g. No worn or altered. Weight:1-1.5g(10PCS). About Size: 3mm. Necklace Pendant Earrings Bracelet Ring Sport601. DIY: If you need your favorite styles, we could customize and process the jewelry as you wish. It's really rare in China that people could do it perfectly well at minimum price. Hallmark: 足金 the gold content 999‰. 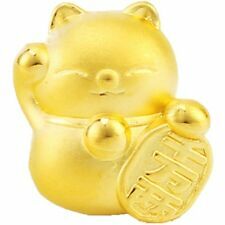 Hallmark: 足金 (Standard 24k gold hallmark in Chinese). Size: 8mm H, 5mm T. Wear the right length. A necklace that falls just below the collarbone goes better with a plunging neckline than a high one. DIY: If you need your favorite styles, we could customize and process the jewelry as you wish. Craft: Classic design, and good craft. Hallmark: 足金 the gold content 999‰. It's really rare in China that people could do it perfectly well at minimum price. 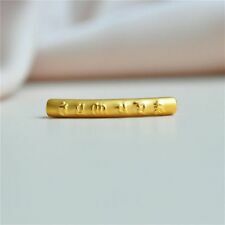 Hallmark: 千足金 999 24k gold hallmark in Chinese. Wear the right length. A necklace that falls just below the collarbone goes better with a plunging neckline than a high one. A necklace that falls below the bust goes with a high neckline. Style: PendantLength: 13 - 15.99"
DIY: If you need your favorite styles, we could customize and process the jewelry as you wish. Craft: Classic design, and good craft. It's really rare in China that people could do it perfectly well at minimum price. 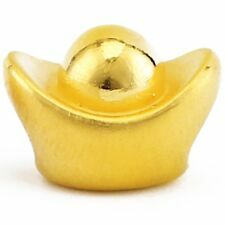 Hallmark: 千足金 (Standard Hallmark for Pure 24k Gold). Craft: Classic design, and good craft. 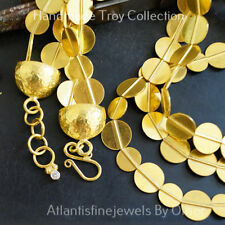 DIY: If you need your favorite styles, we could customize and process the jewelry as you wish. All are qualified. 24K Gold, gold contents 999. S tamp ed the standard hallmark in Chinese. 24K Gold 3D craft, gold contents 999 too. Stamped the standard hallmark in Chinese. 3D is unique craft, the inner part is hollow.